Taylor's Sweet Little Art and Nerd Site: Taylor's Toy Box Entry: Got a toy from a Smoker's Collection? How do you get the smell out of the Plastic? 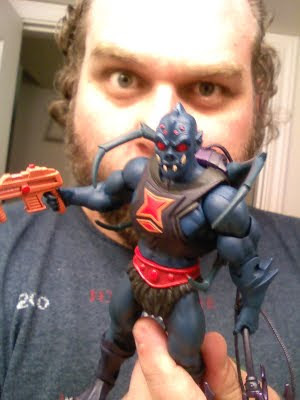 Taylor's Toy Box Entry: Got a toy from a Smoker's Collection? How do you get the smell out of the Plastic? So, the other day I went to my favorite second hand toy store, Dallas Vintage Toys. I bought a Masters of the Universe Classics Webstor. It's a great piece, except for one thing, he smells of an ashtray! Now I was warned online and in store that he smelled of tar and cigarettes. So I went into a cleaning frenzy when I got home and I've cleaned him three times now! The smell is not 100% gone, and I'm not done cleaning him, but I figured I would share what I used to clean him, so if you end up in the same situation, maybe my info will help. So, this is what I used. 1. Lemon Juice. Basic, environmentally friendly, and strong. I use this to help pull some of the smell out, and take some of the tar off of the plastic. 2. Baking Soda. As with lemon juice above, basic and environmentally friendly. I use this sparingly as to not scratch off the paint or patina. 3. Oxy Clean Pre Fabric Cleaner Spray. Ok, so this stuff is amazing. I used to use the Oxy clean laundry powder back in the day to refurbish the outer shells to Nintendo Entertainment Systems. I am not sure if Oxy Clean is environmentally savvy, but watching the Oxy Clean pull Tar off of my new/used toy was amazing. 4. Basic Dish Soap. I use this to help with smell and to keep the Oxy Clean frothy. So far, Webstor's smell has improved by about 70%. From what I am smelling, the softer the plastic, the more it seems to absorb the smell. The armor, skirt, and spider legs have been the hardest pieces to get the smell out of them. The harder plastics like the body, rifle, and backback have been great getting cleaned. The smell is almost gone in areas with the harder plastics. I plan to clean him a couple of more times throughout the following week. I hope that this solution works well with him. As I clean him, I'll post more information on what I discover with my solution.